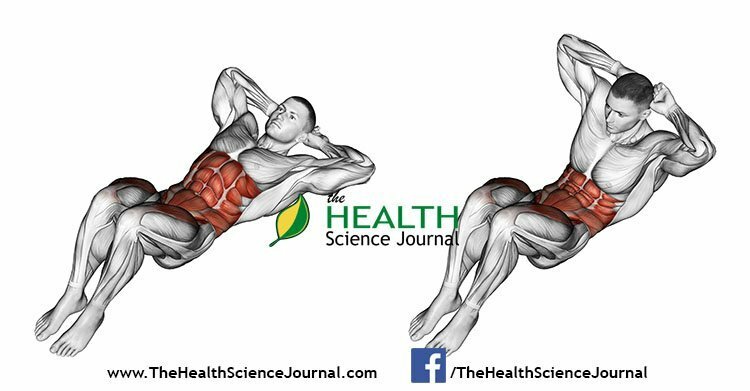 Check our comprehensive guide of 66 pictures and instructions for some of the best ab workouts for men and women both! See the numerous ways you can work out your abs and add your favorites to your routine. 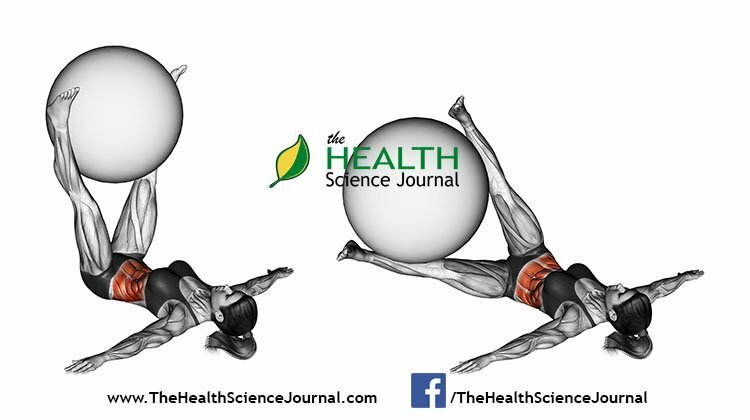 Furthermore, our illustrations will show you exactly which additional muscles you’ll be training with each exercise. Try some of the best ab exercises from multiple disciplines around the world. Enjoy! An effective variation of the abdominal crunch, with some crucial differences. You start with your hands extended above your head and one leg on the floor, while the other remains bended at the knee. At the same time, progressively ascent your trunk bringing your extended hands in front of you and raising the knee of the extended leg. Stop the movement when you bring your elbows and knee to the same height. After finishing the set change the side. Grabbing a bar and hanging, let your body is still down and your legs become straight. Brace your core and use your abs to raise your knees toward your shoulders. Make a small pause when the tops of your thighs reach your chest. Return to the starting position and repeat. While crunches and sit ups only strengthen your abdominal muscles, the ab wheel also strengthens your core muscles. Start by place the ab wheel on the floor in front of you so that you are on all your hands and knees. While breathing in, slowly roll the ab roller straight forward, stretching your body as far as you can without touching the floor. After a small pause, slowly start pulling yourself back to the starting position, tensing your abs and breathing out. 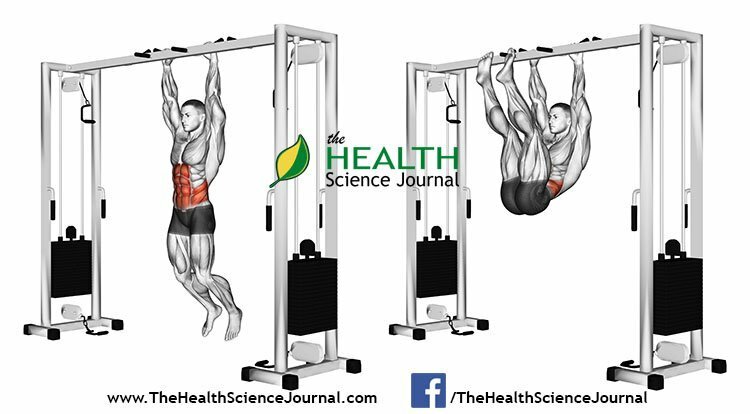 Selecting light resistance, take your position in the ab machine. The arms should be bent at a 90 degree angle as you rest the triceps on the provided pads. Simultaneously, begin to lift the legs up and crunch your upper torso while breathing out. As always, make sure you do slow and controlled motions. Concentrate on using your abs to move the weight and keep your legs and feet relaxed. After a small pause, slowly return to the starting position as you breathe in. Kneeling below a high pulley and holding the cable rope attachment, lower the rope until your hands are placed next to your face. With the hips immobile, flex the belly as you contract the abs so that the elbows travel towards the middle of your thighs, while exhaling. Hold the contraction for a second before slowly returning to the starting position as you inhale. Keep constant tension on the abs throughout the exercise. Sit on a bench with the legs stretched out in front of you slightly below parallel and your arms holding on to the sides of the bench. Your torso should be leaning backwards around a 45-degree angle from the bench. Bring the knees in toward you as you simultaneously move your torso closer to them while breathe out. Pause for a second, then go back to the starting position, inhaling. 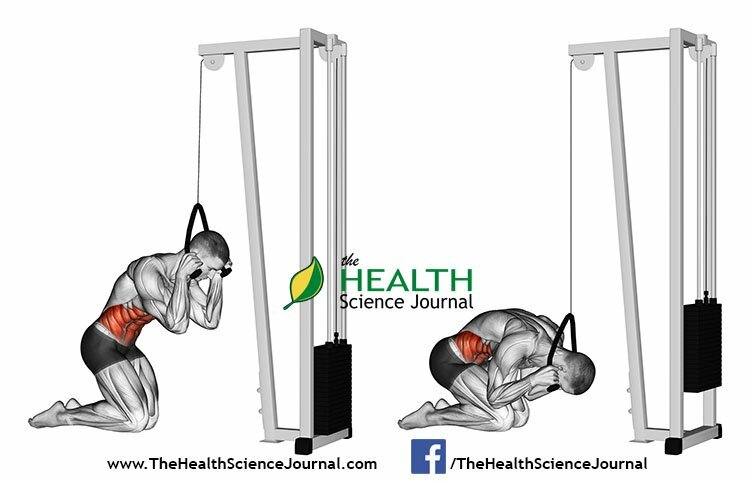 Start out by sitting at the end of a flat bench with a barbell placed behind your head, resting along the base of your neck, as shown on the illustration. Keeping your feet and head immobile, move your abdomen from side to side (only until your abdomen allows) so that you feel the contraction with your oblique muscles. Breathe out while twisting to the side and breathe in when moving back to the initial position. Lie down on the floor with your legs bent at the knees and lacing your feet under a bench with pads (or an adequate alternative). Elevate your upper body to a V-shape with your thighs. Your arms should be fully extended in front of you perpendicular to your torso, holding weight for resistance. 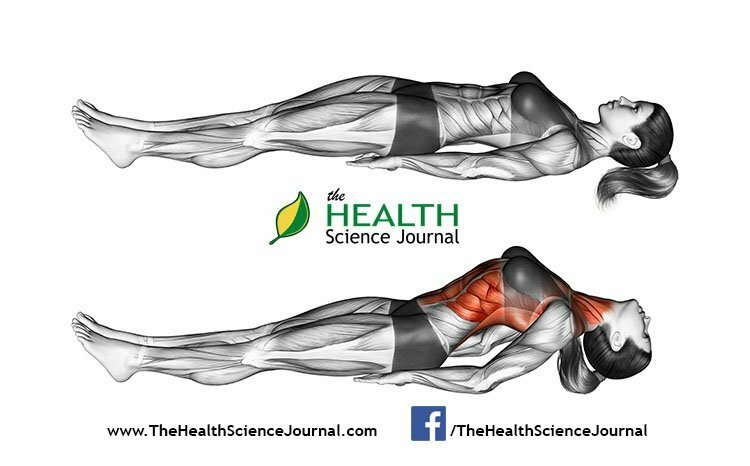 Twist your torso to the side until your arms are parallel with the floor while breathing out. 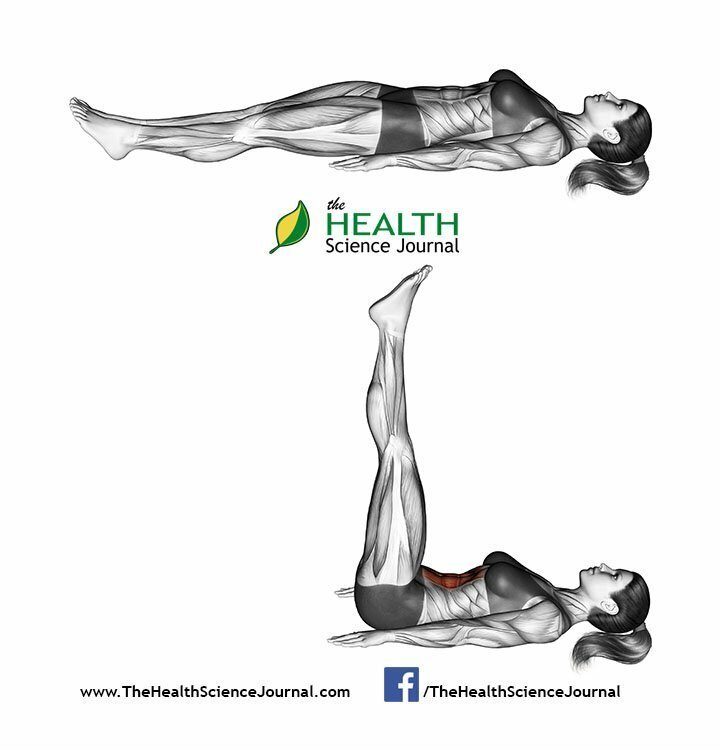 Hold the contraction for a second and move back to the initial position while breathing in. Repeat on the other side. 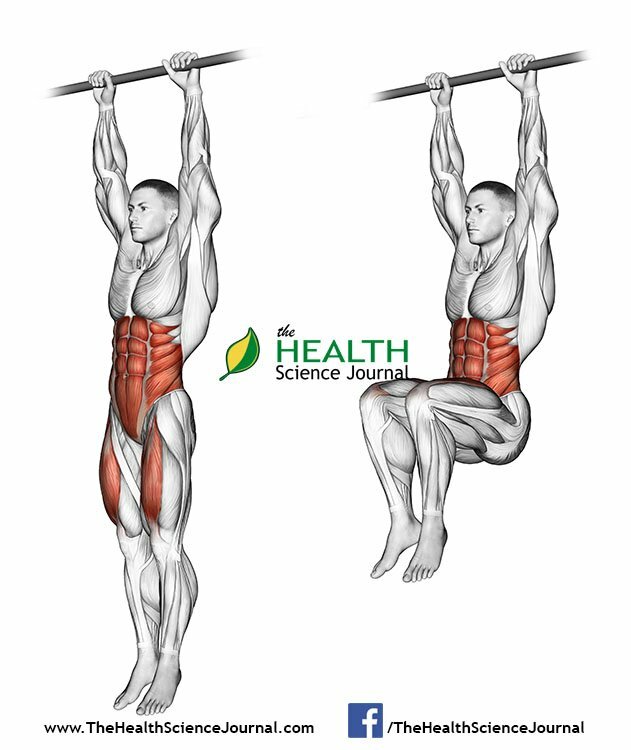 Hang from a bar with your legs and feet together using an overhand grip slightly wider than shoulder width. Holding your legs extended, pull them up as you exhale until you can almost touch the bar above you with your feet. Lower your legs as slowly as possible until you reach the initial position. Use slow and controlled movement, avoiding swinging and using momentum. 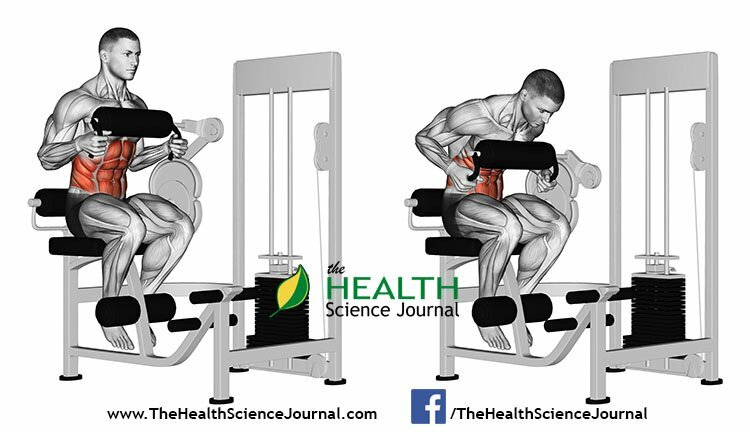 Position yourself on the vertical leg raise bench with your forearms resting on the pads next to the torso and holding on the handles. 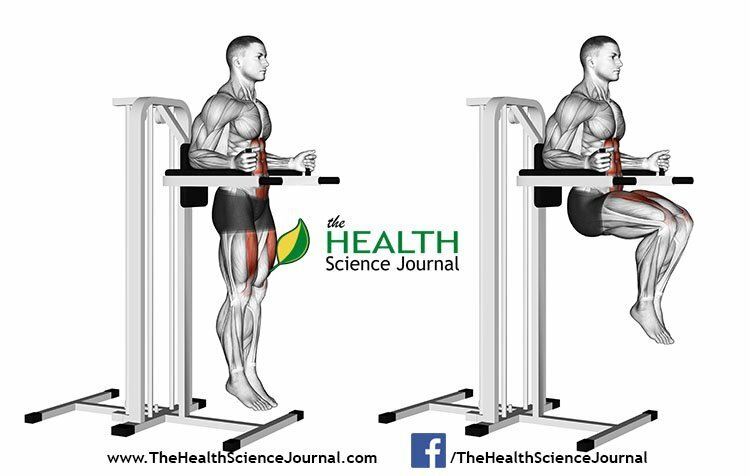 Press your lower back against the pad of the machine and extend the legs pointing towards the floor. Breathing out, lift your legs up until your knees reach the height of your pelvis, around 90 degrees with your torso, then hold the contraction for a second. Slowly go back to the starting position as you breathe in. Stand upright with your feet shoulder-width apart and facing forwards, knees slightly bent. 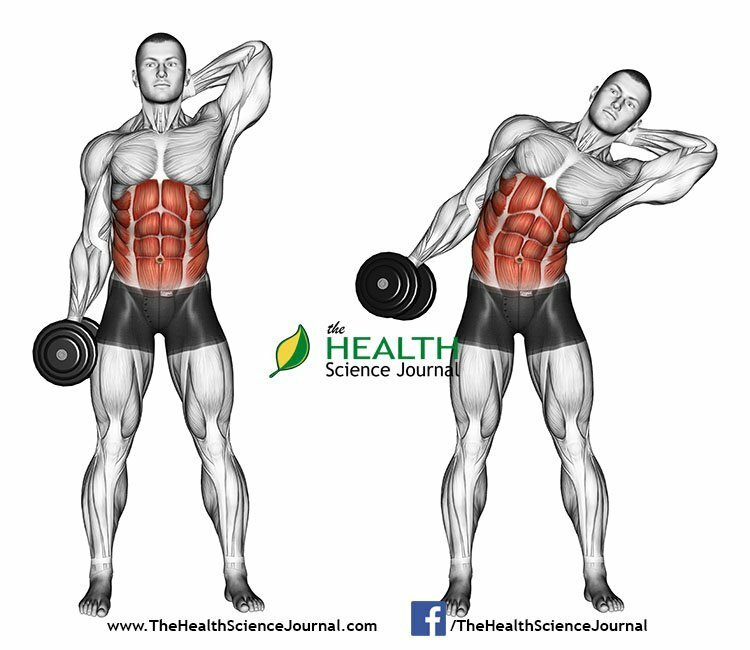 With a dumbbell in one hand, the other behind your head, slowly lean to the side with your elbow of the hand supporting the head, bending only at the waist. Straighten your torso by contracting your obliques. Both sets of obliques will work in each direction as you lean and raise. 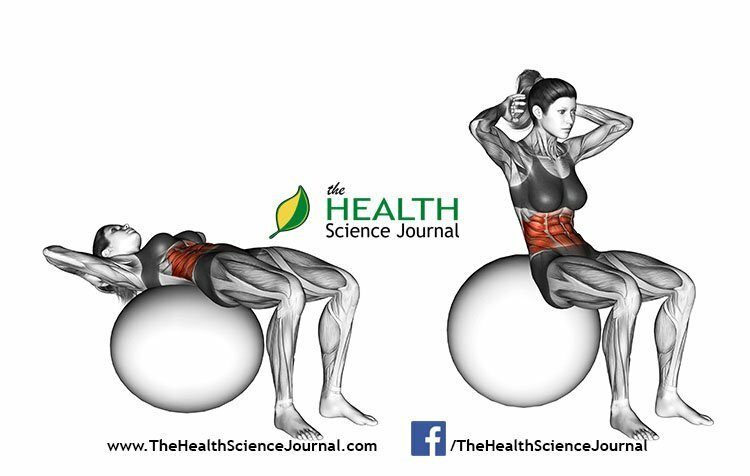 Lie on an exercise ball with your lower back curvature pressed against the spherical surface of the ball. Your feet should be bent at the knee and pressed firmly against the floor. 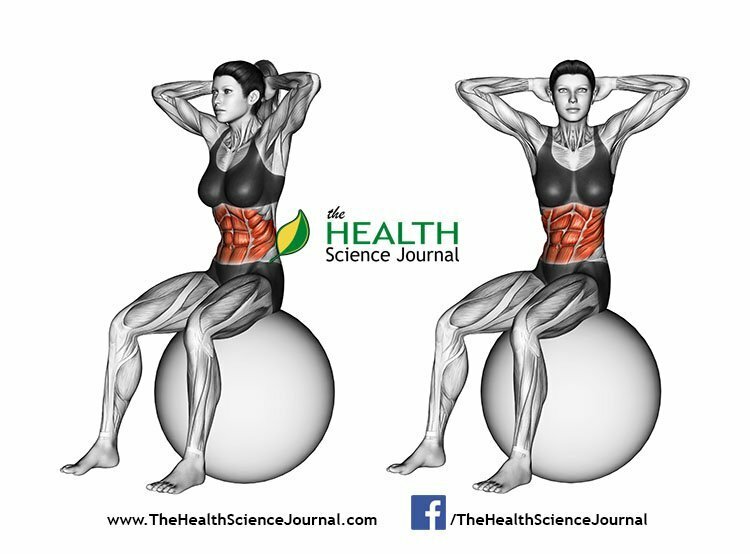 The upper torso should be hanging off the top of the exercise ball, hands behind the back of the head, but not locked, the neck stationary at all times. 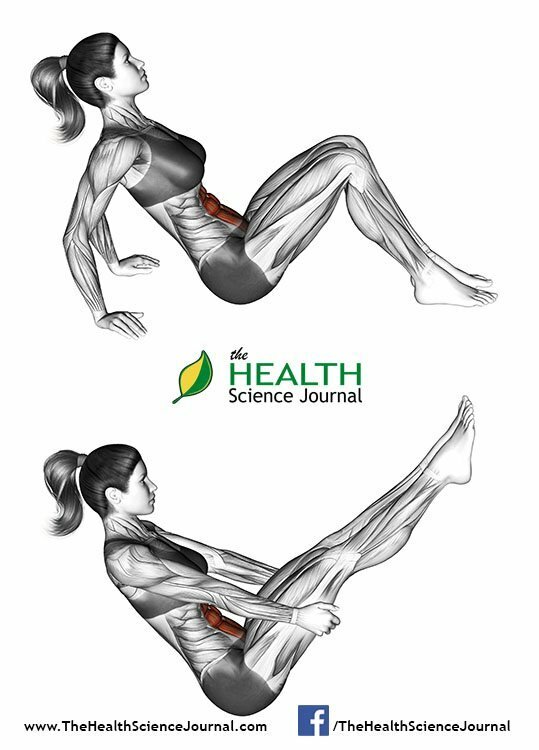 Next, exhaling and keeping the hips immobile, flex the waist by contracting the abdominals and curl the shoulders and trunk upward until you feel a nice tension on your abdominals. 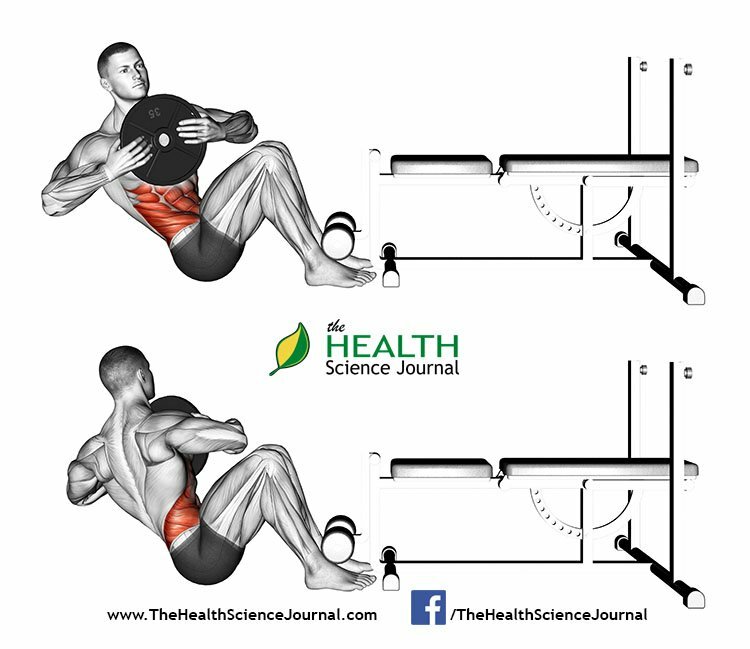 The lower back should always stay in contact with the exercise ball. Hold the contraction for a second, before you inhale and go back to the initial position. 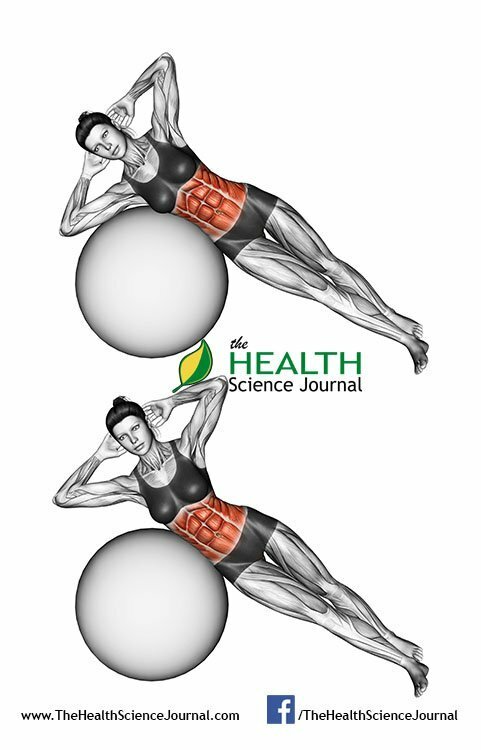 Lie sideways with one hip on top of an exercise ball. Place your arms behind your head. Put your top foot behind your bottom foot and crunch upwards on the exercise ball lifting your upper body while exhaling. Return to the starting position as you inhale. Alternate sides after each completed set. Lying flat on your back with the arms stretched out to each side and palms flat on the ground, squeeze an exercise ball in between your feet and raise your legs to the ceiling. Pressing the ball with your feet and exhaling, lower the legs to one side as far as possible without letting the upper back or arms come off the ground. Then inhale, return the exercise ball back to the center and do the same for the opposite side. Sit upright on an exercise ball, placing your hands behind your head and planting your feet firmly on the ground. This is your starting position. Slowly turn to the side while exhaling, using your waist and tensing your abdomen, while keeping the legs immobile and balancing on the exercise ball. Hold the contraction for a second then return to the starting position while inhaling and do the same for the opposite side. You start by laying with your back flat on the floor, keeping the legs bent and feet planted on the floor for stability. From this starting position, exhaling, take both of your hands and move them towards your right thigh until you reach your knee and feel a stretch in your abs, then return back to the starting position, breathing in. Repeat for the left thigh/knee. The pelvis rise is a variation between a basic and a reverse crunch. Just assume the basic crunch position, with your hands behind the head and the legs bent at the knees. Exhaling, lift your pelvis of the floor (but keep your feet firmly on the ground) while simultaneously rising slightly your elbows from the floor. In this way you are working your abs both from the top down and from the bottom up. Return on the floor and inhale. Try to squeeze your abdominal muscles as tight as you can for a few seconds with each crunch. Start by placing your feet shoulder width apart, elbows bent out to sides with fingertips behind ears and maintaining a good posture. While beginning to exhale, squat slightly then shift weight to left leg as you stand, lifting your bent right knee and rotating torso toward right so left elbow and right knee meet in front of chest. Return back to the starting position while breathing in. Repeat the movement and alternate sides. Start lying down with your back against the floor or on an exercise mat. The arms should be fully extended to the sides with the palms facing down, remaining immobile for the duration of the exercise. Slightly bending the knees, lift your legs up so that your heels are some 6 inches from the floor. This is the opening position. Continue by lifting your left leg up to about a 45 degree angle while simultaneously lowering your right leg until the heel is about 2-3 inches from the floor. Switch movements by raising your right leg up and lowering your left leg. Stand straight with your feet shoulder-width apart. Hold hands by your side. Contract your abdominals by pulling your navel to the spine. Inhale. To begin the exercise extend one arm sideways and bend at the waist on the opposite side of the extended hand as far as you can without swaying your hips. Tense your abs and exhale. Pause for a second and slowly return to the initial position and without stopping continue the movement to the other side. Keep alternating sides until you reach the desired number of repetitions or time limit. 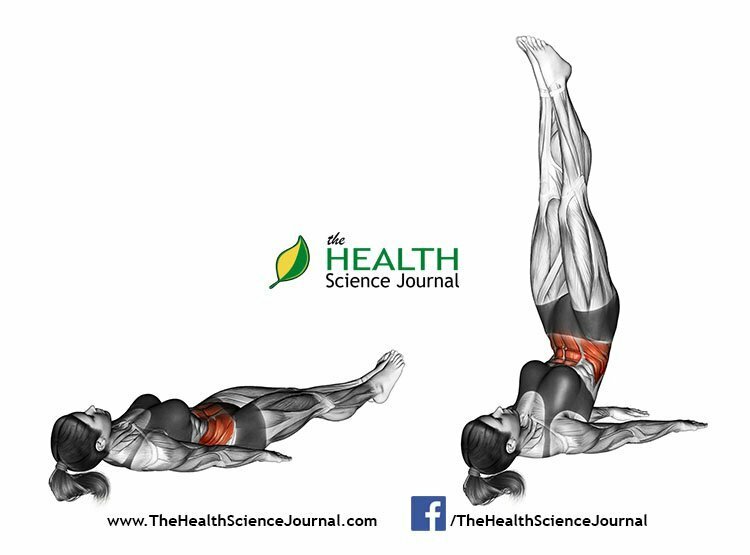 Lie supine on the floor with your knees bent, feet together. Keep your arms on your side, palms on the floor. Exhale and, pressing your feet and arms into the floor, push your tailbone upward toward the pubis and lift the buttocks off the ground until the thighs are about parallel to the floor. Keep your knees directly over the heels, but push them forward, away from the hips, and lengthen the tailbone toward the backs of the knees. Maintain the position and move your arms over your head. The Cat-Cow Pose is one of our favourite stretches. Start on your hands and knees on your exercise mat. Line up your hands underneath the shoulders and knees under the hips. Exhale, tucking the tailbone and rounding the spine towards the ceiling, and release the neck. Then inhale, lifting the shoulders and seat bones towards the ceiling and raising the head to look straight ahead. Repeat slowly and gently as many times as needed to warm up the spine and core. Start off in a squat with your feet close together and your hands placed on the floor shoulder width apart. Bend your knees, bring them right next to your upper arms and then keep your feet close together moving onto your tiptoes. Once set in this position, lean your body forward allowing the transfer of your weight to move from your toes to your palms. Let your abs do the lifting and arch your hips towards the ceiling moving your feet closer together near your buttocks. Keep your ab muscles and legs in, straightening out your arms and hold this position for up to 5 breaths. Slowly come down to the starting position and repeat. Lie flat on the floor. As you inhale, simultaneously, feet flexed, lift your legs, knees straight, into a vertical position. Press your lower back into the mat, preventing injury to the lower back and spine. Exhale and lower your legs. Neck is relaxed throughout. Make sure to keep your lower back and buttocks on the floor to avoid any spinal injury. Lie down on your back with your legs extended and your feet together. Place your hands, palms down, underneath your thighs. Pressing down on your elbows, inhale and arch your back. Drop your head back so that the top of your head is on the floor, but your weight should rest on your elbows. Exhale. Breathe deeply while in the position, keeping your legs and lower torso relaxed. To come out of the pose, lift your head and place it gently back down, then release the arms. Start in a standing position, and inhaling deeply, lift your hands upwards. As you exhale, bend forward in such a way that your body is parallel to the floor. Inhale, then exhale, and bend forward completely, with your body falling away from the hips. Try to touch the floor, with palms straight on the floor, or even under your feet, without bending your knees. Beginners can try touching the toes or just the ankles to start with, working your way to the floor. Exhale, leave your toes, and lift your body back to a standing position. Sit on the floor with the legs stretched forward and the toes and feet pointing up. Separate the legs into a V shape with the knees facing the ceiling. Use your hand to balance an upright sitting position. Inhale, with the arms in front of you and lengthen the spine. Keeping the spine straight, bend forward at the hips, moving the hands forward between your legs. Then exhale and place the hands over your head, palms pressing down on the floor. Keep the back straight and try to bring the breast bone parallel to the floor. Contract the abs and thighs and continue to press through the balls of the feet. I tried the wheel. I know it works the abs because its so intense. But it created major back strain & pain in short time. So I gave it up for a long time. Then, I went back to it. The same back pain issue. And I followed the instructions completely about how to perform exercise with it.